The vast majority of my low cost portfolio consists of low cost trackers. The one big exception to this is my UK High Yield Portfolio (HYP), which has just completed its 4th calendar year and contains a not insignificant £60,000 or so of my hard earned wealth. I am a big believer in passive index tracking as I don’t believe it’s possible to consistently beat the market over a very long time (think 40 years or so in my case). So why did I start a HYP then? It all centred on trying to understand my own psychology. At some point in the not too distant future I'm no longer going to be in the portfolio accrual stage and instead will start drawing down on my wealth. As a very early retiree my draw down phase is with any luck going to be a long time. It could even be equivalent to my whole 43 years of life so far. For me at least I feel that selling down assets to eat on a good day could be psychologically difficult even for somebody as rational as me. I could only imagine how difficult it would be if Mr Market had tanked by 50%. So with that in mind I set myself a task to position my portfolio to have a very good chance of being able to live off the dividends and interest only from my portfolio. BP. Bought in January 2015 and currently sitting on an annualised capital loss of -11.1% and a forecast dividend yield of 7.4%. Rio Tinto. Bought in March 2015 and currently sitting on an annualised capital loss of -37.1% (ouch!) and a forecast dividend yield of 7.5%. Legal & General. Bought in May 2015 and currently sitting on an annualised capital loss of -1.1% and a forecast dividend yield of 5.0%. National Grid. Bought in July 2015 and currently sitting on an annualised capital gain of +25.3% and a forecast dividend yield of 4.7%. 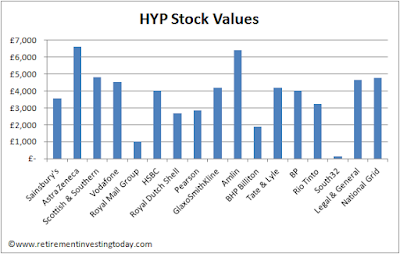 The complete HYP and their respective values are shown in the chart below. The purchasing rule that I follow is the amount of the next purchase is the median share value of the current portfolio (with the exception of RMG and S32). It really is interesting to note how quickly 2 shares can diverge in valuation. Take the journey of Amlin and Billiton as examples. Amlin was bought in August 2014 and its annualised gain is a healthy 32.2% (being acquired of course has helped that a lot) compared with Billiton which was bought only a month later and is now nursing an annualised loss of -44.3%. 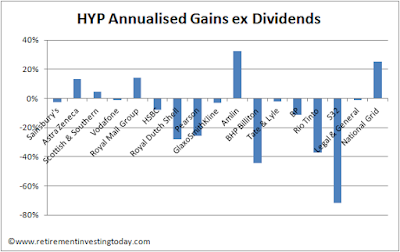 The annualised capital gains/losses of my complete HYP are shown in the chart below. Psychological benefits are all well and good but if my HYP strategy can’t at least match the total return (dividends + capital gains) of a simple FTSE tracker over the long term it’s not doing me any favours. I’d be better off selling up, buying a tracker, accepting I’ll need to sell down capital to eat and then going fishing. Dividends. The trailing dividend yield of the HYP for 2015 is 5.2%. In contrast the FTSE100 is 4.0% and the FTSE250 is 2.6%. So far so good. Capital Gains. Over 2015 I’ve suffered a capital loss of -6.4%. In contrast the FTSE100 has lost -4.9% and the FTSE250 has gained +8.4%. Since HYP inception my gains are 24.8% compared with the FTSE100’s 17.5% and the FTSE250’s healthy 75.9%. Total Return. For 2015 my HYP has mustered a loss of -1.2% while the FTSE100 has lost -0.9% and the FTSE250 has gained 11.0%. A pretty poor showing in 2015! It’s also fast not looking like a very clever long term strategy either. I’ve already proven I can’t trade. The question I'm now starting to ask myself is am I also rubbish at investing? Let’s see what 2016 brings. Happy new year RIT. I'm sure you know this already but I would say a few more years under the belt are required before you write off your HYP folly/experiment. 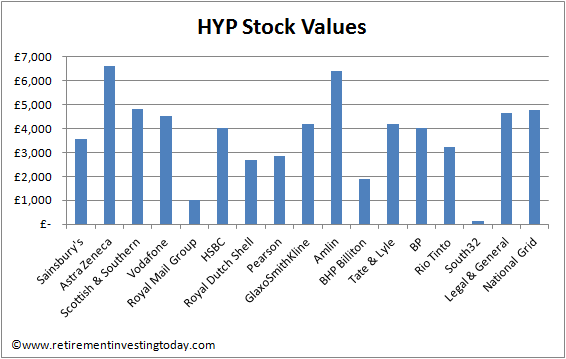 Personally I'm not a massive HYP fan other than when the market is hugely overvalued, which it currently isn't. Firstly John, many congratulations on the 14.3% total return in 2015. A superlative out performance against any reasonable benchmark. A 2015 like that would have had me knocking on the FIRE door about now. Of course I know our portfolios are quite different and I'm happy any time I exceed a real return of 4%. I'm certainly not intending on writing off the HYP folly just yet. I'm always conscious that last years dog can become next years star. If I was a betting man I'd say the HYP will certainly be around for the first few years of FIRE. We'll then see how living off my portfolio plays out before making any changes. Wishing you a 2016 as successful as 2015. Happy New Year. I'm always impressed by your dedication and the level of detail you go into tracking your investments here. I'm also inspired by the results of UK Value Investor and was considering the idea of dividend investing myself over Christmas, but I think I've reached the conclusion that I have little chance of beating the market over the long term. I'm just not that clever. I also like the idea of the Permanent Portfolio with its low drawdowns, but the returns from that don't sound particularly promising at current valuations, particularly with LT bonds and possibly even stocks. So my new plan for 2016 is to just go 50/50 stocks/bonds with Vanguard LS and forget about it. I know the TER is slightly higher than I might pay using the individual funds, but they seem well balanced and a reasonable compromise for a simple life. I will prop up the rest of my income with buy to let, which has its own drawbacks, but feels safer somehow; at least in my head. In the end, I suppose there is no perfect solution, because we're dealing with something that nobody, even with perfect historical data, can control or predict - the future. I wish you a prosperous 2016. Happy New Year Anon. Thanks for the compliment. It's just a shame that 'dedication' and 'detail' doesn't equal portfolio performance. Harry Browne's Permanent Portfolio is something I don't have a lot of experience of. I do know from previous discussions with readers that some were at least considering it as a strategy. Hopefully somebody will chime in with how it is working out for them. I think you will go a long way before you find anybody who is negative on the Vanguard LifeStrategy theme. I know I've certainly written about it in the past. I also know that John Hulton over at diy investor (uk) (link to his blog in my sidebar) is certainly in the process of moving a lot of his wealth across to this strategy. - 2015, VG 2.3%, RIT Still waiting for some lagards to pay dividends but know I will be less than this for 2015. £1 invested in VG would be worth about £1.39 about now. In comparison £1 in my portfolio would be worth about £1.26. I know which is easier to manage and keep track of also :-) The only caveat to this is my portfolio performance also includes all platform fees (something to consider particularly if putting in an ISA or SIPP where extra charges for OEIC's seem to commonly occur) and withholding taxes although even with that I'd say Vanguard would still be ahead. Wishing you a prosperous 2016 as well. Interesting to see the comparison. This reflects the underperformance I experienced over a 5 yr period and why I decided this year to call it a day on my individual shares portfolio. As you point out, I have moved quite a lot into the VLS60 fund (no income taken so far) but also I like the Vanguard UK Equity Income fund which may be worth a look - current yield around 4.6%. As you say, its probably early days for the hyp and the more years that pass the better picture will develop. Happy New Year John. Many thanks for jumping in and confirming how you're transitioning. Hopefully Anon has headed your way for some more insight. Small caps turned out to be the best asset class in 2015. Low interest rates make it easier for small companies to obtain funding..
Great to hear from you K, it's been a while. A sterling based punter wouldn't have done half bad with a big chunk in something as simple as an MSCI Japan Index tracker either. We have low oil prices this year, who is going to benefit more of low oil prices? For the medium term I bet that the idea of Saudi is to send the oil prices higher again, that means 2016 could be a speculative and risky opportunity to look into MENA region. My long term goal is 50% real state and 50% stocks, live from the rentals/dividends without touching the principal, so far I'm overexposed to real state but the rentals are good enough to cover for my living expenses right now. Is your real estate REIT's or is it Buy To Let? If BTL is Clause 24 going to affect you from 06 April 2017? It is BTL, but I'm not based in UK, yields in UK are okish, costs high, plenty of bad tenants... I have properties in Budapest, Abu Dhabi and Manila. Obviously it is difficult to manage properties overseas if you don't have the right contacts, also doing the research to buy and sell it is challenging. I've found that timing the real state market is way easier than the stock market and even if you are late to buy or sell you can have a late chance. I'm still confused as to why dividend-focussed investors try to beat a market index. The whole point of dividend/high yield investing is to generate income, eventually enough to live off. Market gains are irrelevant as toy then have to sell to eat, which as you say, is psychologically difficult. I know it certainly is for me anyway, despite my current usage of some of my portfolio to pay for general household expenses eg I sold my shares in Ford to pay for car repairs, tax, insurance, etc. Luckily, the 50% gain on the shares was plenty, but I'd rather just have a lot of dividends landing in my account to pay for things instead... The psychological difficulty of selling what you've built up for such a long time is so, so strong! "I'm still confused as to why dividend-focussed investors try to beat a market index." I'm not but I need to be at least matching on a total return basis over the long term or I am just damaging my portfolio and fooling myself for psychological reasons. Long term I might be better off just tracking an index and instead focusing on sorting out my non-financial side. I've the opposite confusion. I always wonder why people switch to income generating vehicles in retirement. It seems illogical to me to distinguish between 'income' and 'growth' approaches when the bottom line is both are 'return'. My plan at retirement is to stick with ACC 100% and sell quarterly. I could switch to the INC versions of trackers but that would just change the amount I needed to sell each quarter so that's no benefit. Perhaps I'm some quirk of nature but I have no psychological problem with selling off a portfolio in retirement. The fear of becoming too muddled to execute a strategy that treats income and CGs the same: a dividend strategy is much easier as you undergo "cognitive decline". I always read your HYP portfolio updates with interest as I too would like some income from dividends, rather than just sell off my funds. Whilst still investing in index trackers, I hope to ramp up my purchase of both shares and investment trusts this year - my portfolio is only modest, so am aiming for a modest increase. I don't think I'll ever 'beat the market' - if I can just achieve the goals I've set myself, then I'm happy. Here are some challenges for you - I hope you find at least some of them provocative - but not too confrontational . They are meant to be about looking at the overrall approach to investing that you are taking. You always seem to be open about what you are doing - and usually why . I think investors need to be as clear as they can be about what they are trying to achieve - and that usually determines the choices that need to be made and which risks to take - or avoid. I . Your split between your tracker funds and your HYP portfolio is -honestly - totally artificial. It is compartmentalised in your mind as if they are separate entities - which they are not. They are both constituents of your overrall wealth and investment portfolio. 2. Your equity portfolio is too small for individual company share holdings . Although you are saving on management fees - you are giving yourself a lot of admin work sorting out divi's and any shares held ex-ISA may need CGT calculations if you are in danger of exceeding your annual allowance . 3. You are over-obsessed with ultra-low fees rather than an alternative which is to accept that there are many active fund managers who have and will continue to out-perform your portfolio performance even allowing for fees. OEIC's and IT's also increase your diversification - give you access to investments and markets that you have no exposure too . May I suggest that it is somewhat arrogant to think that you can outperform with your HYP ? - and in any case it is your overrall and all inclusive performance that counts. You have exposure to BHP and RTZ in your HYP as well as in your trackers -where you will also have been exposed to Glencore and Anglo - when all of this sector has performed very poorly this last year . 1. Get as much of your ex-pension investments into ISA wrapper and don't worry if that incurs a small increase in annual costs. 2.Look at your OVERRALL assets and work out asset allocation on the total amount. 3. Accept that higher fees may be worth paying if they are accompanied by out-performance. Clarify your true objectives ( eg your ideas about where you are going to purchase and property and live seem to be in a state of flux ) Most people would regard this as their absolute first and major priority . Clarifying true objectives will lead you to the paths that you can choose to follow to best achieve them . At your age and stage - I think there should be a greater emphasis on growth of your assets rather than income from them. 4. Emphasis can be altered, adjusted and fine tuned gradually to suit your current and predicted needs - and i do mean gradually - certainly years rather than months. 5. Have a look at Trustnet Sector Performance Tables for OEIC's and ITs over 1,3,6 and 12 months + 1/2/3/5 and 10 years- also have a look at top quartile performing funds and then possibly add in the 4 or 5 crown rated funds as well as the top quartile ranking . Look at the reviews of the managers of the funds that you are interested in - and choose managers with a long track record who consistently outperform both in rising and falling markets in the sector/s that you are interested in. Let's see what response this produces - the above is the first stage of a process that can become significantly more detailed and analytical. But I do believe that a very good professional fund manager is going to do a better job than I ever can. Have to reply in 2 parts given character restrictions. 1. I am already maximising annual ISA contributions with all going into Stocks & Shares. My problem is that my savings rate is higher than the annual ISA allowances so I end up with a big portion outside of the wrapper every year. I also don’t want to put any more into the pension for government tinkering risk, house purchase needs and early retirement spending reasons. 2. This is what I already definitely do. For example when I showed my portfolio in detail here (http://www.retirementinvestingtoday.com/2015/06/my-investment-portfolio-warts-and-all.html) you can see the HYP under UK Equities. I break the HYP out for some extra attention as when I started it I wasn’t convinced it was the right thing to do over the very long term. My current total portfolio is not much different from the listed post: 12.2% Cash, 25.7% Bonds/NS&I ILSC’s, 10.4% Property, 4.2% Gold, 11.5% International Equities, 4.5% EM Equities, 10.4% Aus Equities and finally 21.2% UK Equity (which includes the HYP). That’s 47.5% in Equities against a plan of 50.8%. Nominally I am running an Age-10 in bonds portfolio. What I then did almost from day 1 is then go under/overweight based on CAPE. I haven’t back tested my performance here but gut tells me that this is something that hasn’t worked so well. If I wasn’t adjusted according to CAPE Equities should be 56% today. 3. True Objectives. You are right that we have not yet settled on where we want to live permanently but we do know that we do not want it to be London. This is one of the reasons we never bought as it just isn’t home. It’s been great and we’d do it again in a second but it is not a forever place for us. With a fair wind we have about a year to sort this out so 2016 is going to be busy. I think one of our problems is that the world is very soon about to become a very small place so we are a bit ‘kid in a candy store’. 3. Emphasis on growth. You’ve seen my portfolio vs my 43 years of age. I’m also now achieving the dividends I will need to live off in FIRE (I acknowledge I made it a year or so earlier than I needed to but hey ho) so I don’t need to add to the HYP as I mentioned. With my FIRE ‘salary’ secure you can also see me adding to more growth orientated sectors such as the FTSE 250. Would be interested to hear what would you do given my current state and knowing that I plan to FIRE in a year or so and will need to buy a home? 4. Agree very much with this and everything I do is done at glacial speeds. What have I done. For the first 4 years of my journey I didn’t chase dividends. I then knew in 6 or so years I wanted a ‘salary’ so started to build the HYP. I misjudged this as I made my ‘salary’ 2 years early and I should make FIRE 1 year early. In the last year or so I’ve then started to ramp cash holdings for a home purchase. If we go to the Continent then I think I’ll build the cash with plenty of time to spare but if we stay in the UK I might come up a bit short so will need to do some head scratching depending on progress mid year. 5. This is where I really struggle against your thoughts. The total investing market is a zero sum game against the indices for similar risk so for everyone out performing someone must be under performing. After expenses it must be a negative sum game. If I buy the indices I know what the market has produced over the long term and I know that I’ll get whatever it produces going forward. I don’t know which market will perform when so just buy a bit of all of them and rebalance to achieve an average market return. If I then go active I have two problems – I now have to pick the market and then I have to pick the manager. What chance do I have of picking a manager today who is going to outperform the market over the next 40 years? I am yet to see a white paper that shows how this can be done without luck particularly given ‘past performance is no indication of future performance’. Didn’t even Anthony Bolton eventually end up under performing? By indexing I know I’m going to be average but I know I’ll be ahead of the average active manager by the expenses saved. I’m also conscious that I don’t need out performance. My plan was always about a real (post inflation) 4% but I freely admit that over the last 8 years I’ve achieved only 3%. Even 3% would work as I’m only planning on a 2.5% withdrawal rate. What I don’t need is under performance via an active manger blowing up. Note also that I don’t want to outperform the market but just want to match it from a total return perspective. As always would value your thoughts. why not invest in a high yield dividend tracker if you want a dividend portfolio, since you said yourself you don't believe in beating trackers in the long term? An additional benefit of a high yield dividend tracker is that it's not a static portfolio, they replace stocks each year, and this process of replacing can in my opinion be regarded as a kind of value investing (companies with shareprice becoming cheaper, can result in a higher dividend yield and be added to tracker as a potential growth stock). companies are offering these dividend yields. Quite a number of these yields are unsustainable ( eg see above re Glencore/Anglo/ RTZ and BHP to name a few ). I would suggest that a high yield dividend tracker - or even a HY equity actively managed fund is not going to make you much money in 2016. For an example of an active fund - qv JOHCM UK Equity Income. I think you are in danger of underestimating the potential growth of an investment portfolio even over relatively short time periods . See my posts of 13th Dec.
What I maybe did not make clear is that NO new money was introduced into this portfolio throughout these 3 years and no money has been withdrawn either. making an overrall return of 31.1% after all expenses. present as they seem significantly over-valued. For what it's worth, I'm following the Permanent Portfolio philosophy, although I don't have figures of my returns each year - primarily because I'm not saving that hard / living that frugally (e.g. I still have expensive holidays and an upcoming wedding and honeymoon). If my returns are anything like the Permanent Portfolio Fund (Google Finance MUTF:PRPFX), then it's been pretty terrible since mid-2011! I track my Net Worth on a monthly basis and buy more as and when my % allocation demands it. I buy and hold gold and silver - I will only sell if I need the cash (for example, to put down as a deposit for a house, although I probably have enough cash for this). I do however attempt (fail?) to beat the market by selling stocks and bonds when they drop below a moving average (I use 144 week) and buy back in when they move above a moving average (I use 21 week). This, at least in backtesting, has ensured that severe bear markets are avoided (e.g. 2000, 2007) and that bull markets (e.g. 2003, 2009) are bought back into reasonably early. I did very well from 2009 to mid-2011 from this, but then who didn't? At present, my asset allocation is however ~60% cash, 24% gold, 6% silver and 8% equities (almost entirely my company's SAYE scheme). I'm nervous about the markets and haven't been in equities since Jan 2014 (a bad decision so far since the FTSE250 is up 7% in these two years and the S&P500 about 9%) and out of gilts since Jan 2015 (a good decision so far as they seem to be down 1% over the past year). I think my 2016 resolution ought to be to follow my own rules, rather than staying out of markets due to fear! Fingers crossed there's some bargains coming up in the equities markets in the coming year(s). Oh, and I forgot to mention that I also use an element of value to determine asset allocation. The PP is typically defined as 25% into equities, bonds, precious metals and cash. I choose to include property, as I will be buying a house at some stage, so I drop the allocation to 20% across these five assets. However, since I am out of all the property, equities and bond markets, I'm pretty much sitting in cash, gold and silver until some bargains in any of the other markets materialise. Which Anon are you ? Anon 5/1/2016 @ 18:46 has 60% cash, 24% gold, 6% silver and 8% silver. Anon 5/1/2016 @ 19:14 has the allocations as above. I do wish the Anon's on this blog clarified their anonymity a bit more clearly. Sorry - same Anon, but the second reply is my "supposed" allocations, although as stated, I am actually 60% cash etc. as stated. The reply was just to indicate that I apply value-weightings to my purchases / rebalancing. Mainly responding to your post 3/1/16 @ 19:52. I'm not sure why you keep asking me for my views - as you don't seem to admit to having taken many of the points I have made - on board. Anyway : I reagrd your desire for FIRE to be when you actually give up working altogether - if this is not the case then it is not really FIRE. You are essentially cautious - and I think you will keep putting off actual FIRE when you get near to it " just in case " Also - I don't think the sums of money you are talking about are sufficient to cope with a significant change of lifestyle that not working , owning your own house and possibly living abroad may make - another reason you will put off FIRE . Owning your own house may make you want to do more entertaining at home. Having the days free you may want to go out to the cinema , theatre , ballet - days and week-ends away , eating out more, taking up a sport or joining a gym etc etc. We have a friend who lives in Sydney - both her parents are in care in UK - one daughter lives in Denmark . On average she has made 3 or 4 return journeys from Sydney to Europe in the last 2-3 years . Sadly her father has just died - leaving her demented mother in residential care - but she does not recognise her daughter so the visits will be fewer - but still a significant expense . I would suggest you need to build in a great deal more financial leeway in your plans - or just accept that FIRE is going to happen a lot later than you think and that you will be working for a good few years more. Sorry if this is depressing - but these are my thoughts - and you did ask for them ! Nothing to do with the topics we discuss here is depressing. It's all good information that gets me (and I hope others) thinking. I do admit to moving at glacial speeds (sorry) when it comes to saving/investing/FIRE but I think I came around to the FTSE250 partially because of previous discussions between us. I agree that I am definitely cautious but I also believe that I plan well with meticulous detail (OCD?). I hope that the 2nd trait is the trump card that helps give me the courage to pull the FIRE pin with confidence. That said in some of the fora I read 'one more year' syndrome is rife so I honestly don't know what will happen until the time. One reason I say this is that I do know that my approach to life is already very different because of the £850k I have put into my pocket already. I can only imagine what that will morph into the day I hit £1 million and have FI. I believe I know the lifestyle I want including the type of home and car. I've also done on the ground and internet research. No matter which way I cut it I always seem to fall down on needing circa EUR26-29k per annum (+ a home) whether that be Malta, Spain or Cyprus. That covers essentials, healthcare, taxes and 'fun money'. Interestingly that seems to be where Anon 16:14 below seems to also have settled if talking gross not net of tax. You do however provide plenty of food for thought about other potential costs so thank you. It could all happen in 12 or so months so it will soon all start to get very interesting. SV, I think you are a bit harsh. Although I agree it can't be fire if you don't retire just fi- which is still a good place to be. I think you are both too cautious, if you pick the right country, house prices are much lower than in the uk. I am in France and £160k will still get you a 4 bed house 1 mile from a town and schools. I have lived in France now for 9 years, spending savings until just last year. I can live on £18k pa (family of 4) and now get £25k from dividend income (current yield 3.7%)with the state pension in 10 more years. and chalets in a ski resort. Are your figures pre- or post tax ? I don't think it is possible ( in UK that is ) to avoid paying tax on pension income - so although RIT sounds like he will have a substantial pot to invest - he will only see 60% of the gross sum . So ISA income becomes very valuable - and using up CGT to avoid building up gains in your portfolio that would make it very difficult to sell all but a small proportion. Many thanks for your input here Anon. Would you be prepared to share a breakdown of where that £18k goes over a year? That might really help the discussion moving forward. - Now. Unfortunately I am still adding to non-tax sheltered as well as ISA/Pension because of my high savings rate. - FIRE to age 55. During this period I will be using my CGT allowance plus non-tax sheltered dividends to live and in parallel maximise ISA contributions. - Age 55. Add pension drawdown into the mix while continuing with the above. A while ago I did run a tax simulation (which is a bit meaningless so never posted it because a lot can happen in the next 12 years) based on current known rules which suggested my annual tax liability looked like it could be as low as circa £750. - Spain would be the worst for tax with the new Cyprus rules meaning tax would be negligible to EUR0. Malta is somewhere in between because the non-domicile rules allow some tunes to be played. - All will have healthcare costs (unlike the UK which is essentially free). -- Spain will need private for Year 1 after which an adult looks to be able to buy into state healthcare via the convenio especial at EUR60 per person per month (Velencia). --The Malta route for us would be to likely use the register as self employed route which allows you to then pay social security contributions for healthcare. There do look to be a few options in Malta though with this being the most expensive so we would take some advice here. --Cyprus (until State Pension age) looks like you're on your own but EUR1,000 a year should get a person of my age (rising to circa EUR2,200 or so at age 68) decent healthcare. You of course then multiply those numbers up for wives/husbands + kids. Moving abroad gives you another tax system and health system to learn! Some costs are better and some worse than the UK - you just need to understand them and keep up with all the changes. I understand that pension income in Portugal is not taxed for the first ten years when you move there! Here in France, UK ISA's are not tax free, Pension commencement lump sums are taxable. I get 70% of health care covered but if you move over now and are not working you will have to take out private cover for 5 years. I have budgeted for a 'top up' policy £1.5k but have not implemented it yet. For a family of 4 there is no income tax below about 24.5k euro, although there are social charges (up to 15.5%) until you get your UK state pension. I drawdown up to these limits and top up from cash savings and share sales (capital gains are taxable but these top ups are only modest). "zero sum game " ideas on certain investments . I either forgot to press the publish button - or you have removed it ! I did make some contentious comments about share price manipulation - but I think the former explanation is correct. Thanks for highlighting. I've just been through my large automatic spam folder and found it in there. Not sure which word/s it didn't like. Just so you and all readers are aware I do not delete any posts unless they are clearly spam. I haven't read your response yet but will be sure to digest today. Thanks for your detailed summary. So after expenses, taxes and a healthcare top you're at about £19.6k which at today's exchange rate is about EUR26k. Amazingly that's right in the range of the EUR26-29k that I always come down to no matter which Med country I look at. I guess that shouldn't come as a surprise as the prices per lifestyle bought in any country should alter to match the available cash sloshing around. So if one country has lower taxes it's home prices for example might rise to absorb the free cash. After all if one country had a great lifestyle and took little cash all us FIRE's/Retiree's would flock there which would just push the prices up. I want to take issue with you re. total investment market is a zero sum game ( ie negative after expenses ) Your zero sum game is what you are buying into with your index trackers.I am not talking about foreign exchange or bond markets. Applied just to OEIC's and IT's it is illogical to regard it as a zero sum game . You could have a sector where all the "fund" managers outperform the index - or a sector where all the managers underperform the index . Whether the index the fund's performance is being compared to is appropriate is another matter. But - individual investors and OEIC's and IT funds are not the investments that move markets- the sums are relatively small compared to : pension funds , insurance funds , hedge funds , sovereign wealth funds , companies themselves who can legitimately manipulate their share price by eg - the dividend policy and declared dividends - the way their accounts are presented and which accountants they use, announcements like profit warnings ,M&A activity ,share buybacks, forecasts and predictions , currency hedging policy, depreciation %'ages etc etc. I would be interested in your comments about this - as I feel your attitude to using active funds with the best managers IS the best way to secure long term wealth creation - but you also need advice about how to position your portfolio to spread risk and choose the appropriate balance between correlating and non- correlating assets . This approach obviously requires monitoring of the markets and taking a view , and positioning your portfolio appropriately . Your desire to stick to funds with very low TER's and to stick with them for the very long term rather precludes you from taking this approach . If I was in your position I would also be taking a more cautious approach than I am able to do now - I am 66, retired and have a handsome CPI linked pension backing up my investments so I am in a very fortunate position. I just would not want you to dismiss the idea of going down the active manager route based on a false belief - ie that the fund markets are a zero sum game . PS - thanks for the comment about FTSE 250 index - I hope it works out as well for you as it has for me. Many thanks for this stringvest. This Monevator post http://monevator.com/is-active-investing-a-zero-sum-game/ summarises my thoughts far more eloquently than I could ever hope to. Could you highlight the error in the thinking? I would love to beat the market with active investment but just how can I be guaranteed to find the "active funds with the best managers" in the right sectors consistently? Let me give an example that I know as I hold it. The Perpetual Industrial Share Fund (https://www.perpetual.com.au/~/media/Perpetual/Fund-Profiles/127_pfp.ashx). Over the long term this fund has outperformed its benchmark however in recent times it has under performed. How do I (or anyone for that matter given how complicated a financial world we live in) as someone who would be prepared to monitor the markets and take a view know if that active fund is going to under perform or out perform over the next 20 years? I'm not going to leave it there though and as always will digest your thoughts at glacial speeds. Moving slowly I think has definitely helped me a lot in life so I'll continue with that. Anything more you throw into the mix is appreciated and will only add to my (and hopefully others who aren't prepared to enter into the discussion) thought process. Thanks again. It's great to have an opposite view. I will read the monevator link and then give you my thoughts. You are right to ask about future performance - it's THE question we want answers to - but that nobody can give. So a huge amount of attention and analysis is applied to past performance , historical data ,charting , moving averages etc etc. Mirror Group and Maxwell's pension raid. Or even a fund manager leaving unexpectedly and moving elsewhere. Our only hope is to spread the risk sufficiently that no one single event wipes us out completely .eg 2009/10 was a great time to invest in IL Gilts . Spread includes all sorts of different choices : company size , countries , Continents , Sectors , Prefs, Warrants and Convertibles and split between Equities / Bonds / Property / Bullion / Art / Stamps / Wine /Rare Cras etc etc. I don't think there is a chance in hell that I could do this on my own - so I use a stockbroker - and for my investments we choose almost exclusively collectives. And those with the Managers whose approach we like , whose performance meets our criteria , funds with an unconstrained and flexible approach , maybe contrarian aiming to end up with a mix of assets some of which are non- correlating . really quite light on FTSE 100 companies, 2% in bonds ( but I do have quite a lot of ILSC's as you do ) Some absolute return exposure ( recent- as they used to be absolutely no return funds ! ), Specialist Funds etc.